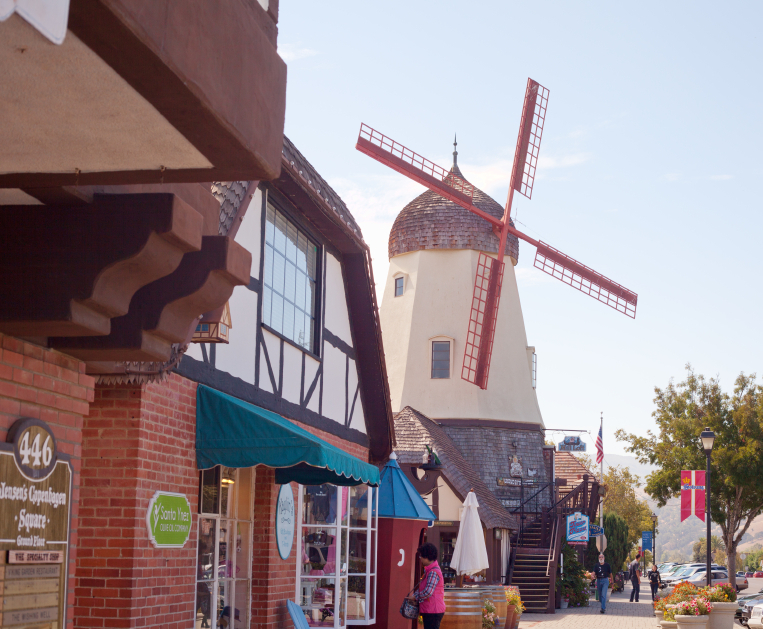 Solvang California has defined kitsch for well more than half a century – a Danish village in Santa Barbara County complete with a faux windmill, plenty of restaurants that serve aebleskiver, and shops that sell Christmas ornaments and decorations all year long. As far back as the early 1950s my mother liked to take day trips to Solvang. I never understood why. It was a five-hour roundtrip to eat pretty ordinary pancakes and browse in shops that had virtually nothing she would want to buy. Freeways, improved highways and faster cars have shortened the drive. But the kitsch is still there – on every block of the tiny town. Only now it’s been joined by some very worthy restaurants, nice hotels, and decent sights to visit in the area. The movie is credited with driving up international sales of Pinot Noir wines and temporarily damaging sales of Merlot. I thought the movie’s rap on Merlot was unfair and inaccurate. I also thought the movie grossly overrated the quality of wine produced in the area. I think California’s central coast wines are a great example of marketing mediocre wine. It’s no different than any number of other parts of the country that profess to be a regional wine area and offer up wine that sells nowhere outside its own small region. But that’s the subject of a future article. What is inarguable, however, is that the movie created a tourism boom for the area that has not yet abated. When my senior golf club visited the area for a two-day tournament recently, a number of members went for dinner the first night at the nearby Hitching Post II restaurant in very nearby Buellton. That’s the restaurant at which Virginia Madsen was a waitress in the movie. While there’s a rough and tumble to The Hitching Post, Root 246 and The Willows are distinctly up the scale ladder. Root 246 gets its name from the “highway” on which it’s located – Route 246. Arrive early and relax in the lounge, a feel good bar that encourages conversation among strangers and affords intimacy for those who prefer privacy. Then make your way into the dining room, where you’ll find traditional seating as well as high-back, couch-style benches at dark wooden tables. It’s a short menu – usually six or seven entre choices. But there’ll be chicken, beef, fish and vegetarian options. There’s a nice cheese selection, some house made sausages, and an original selection of appetizers. I had the hanger steak as my main. It was tender and cooked perfectly. Jennifer had a special called pork shoulder. It was tender and tasty. The Willows is housed at the Chumash Casino Resort just outside Solvang. The starter selection should be enough to satisfy any taste. Entrees fall into two impressive groups. The meat is from a variety of quality providers – certified Angus rib eye, porterhouse and chateaubriand; Colorado lamb; free range Colorado bison; and milk fed veal. The seafood selection is equally impressive – Dover sole, lobster, arctic char, and a luscious cioppino. There’s also karabuta pork and roast duck. All this in a stylish dining room at a well-appointed resort. A third excellent dinner choice is three miles away at the Ballard Inn. It’s called The Restaurant at The Ballard Inn. The 15-room Inn itself is lovely. The Restaurant is intimate and romantic – just 12 tables, candles, soft music. There usually are just five or six entrees on the menu, but each is inventive. It’s also one of the few local restaurants with a list that includes wines from out of the area. There are scores of hotels and motels in Solvang and the surrounding area. Most of them are old and past their prime regardless of how good they look on their web sites. The Ballard Inn mentioned above is old but still well-maintained and lovely. Hotel Corque in Solvang and the Chumash Resort in Santa Ynez are newer, more modern, comfortable and well run. The staffs at all three are friendly and helpful. And all three are well situated to serve as home base for local sightseeing and recreation. For those with a gambling itch there’s the Chumash Casino; golfers will find The River Course at the Alisal challenging but fair. The nearby Lufa Farm offers free tours. Catered lunch can be arranged for groups of 8 to 45 at $14 per person. Check the NASA website and see if there might be a launch scheduled at nearby Vandenberg Air Force Base. A short drive to Lompoc can afford a good view. I wouldn’t think of a visit to Solvang that didn’t include a stop at Ingeborg’s on Copenhagen Drive. I’m not really a chocolate eater. Jennifer, my wife, carries that responsibility for the family. But I could eat my way from the front of Ingeborg’s to the back. And to the left of the front door is ice cream paradise. 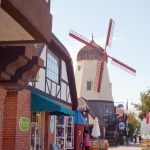 So, if you like kitsch, or feel like shopping for Christmas ornaments in July, or if you just want a weekend getaway from L.A., or a nice stop while motoring north or south on the coast, give Solvang a look.